Probably, the two men behind the Commodore PET 2001 computer – Commodore International’s founder, Jack Tramiel, and the company chief designer, Chuck Peddle – would have actually preferred to call it HAL 9000. Indeed, many elements of this famous late-70s PC were somewhat inspired by A Space Odyssey‘s infamous thinking machine; from its evocative three-letter name, to the PET logo Microgramma typeface (the same used by Kubrick for HAL’s graphic interface), to the addition of the number 2001 which, apart from that reference, is totally senseless. 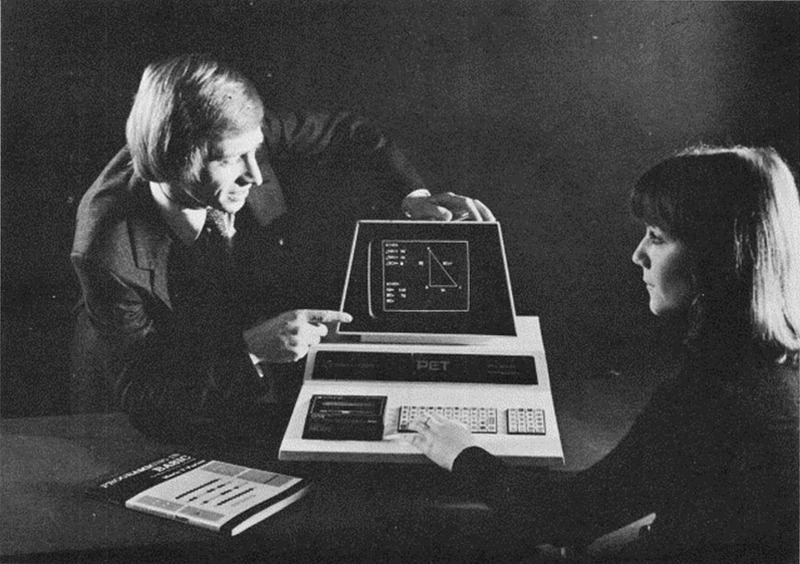 Overall, the PET possibly manifests like no other machine the influence of the aesthetic of cinema on a computer design. The PET 2001 can be considered the first all-in-one home computer and, under many aspects, the first commercially successful personal computer ever. 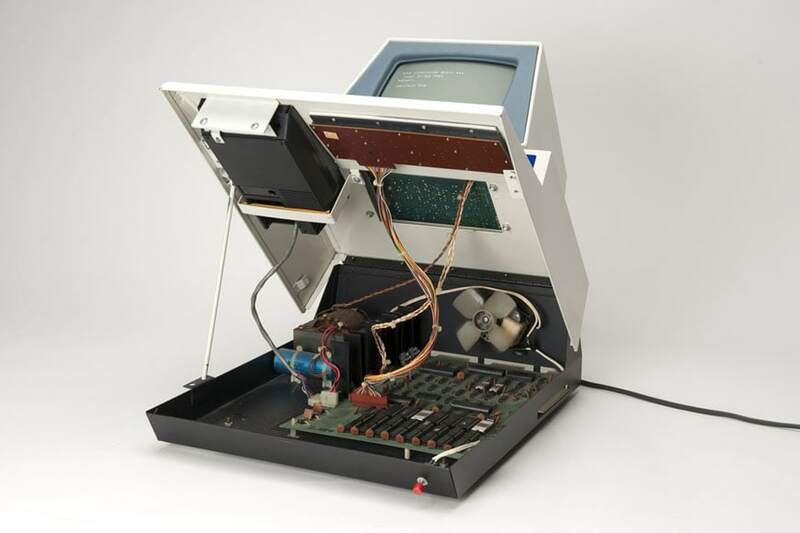 It was based on a MOS 6502 processor (which also powered the Apple II) and equipped with a cassette recorder as a mass memory device, a keyboard with 53 buttons, a 20-button numeric keypad, and a 9-inch monochrome CRT monitor (manufactured by Sony). 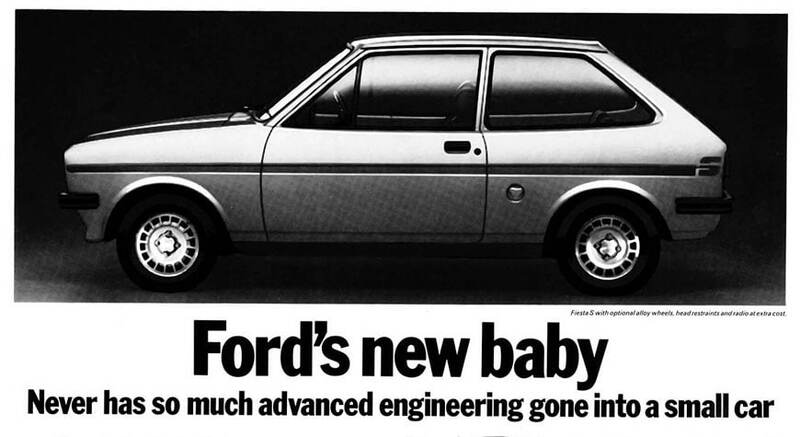 The default RAM amounted to only 4 KB; yet, Commodore quickly released a version with 8 KB to improve the performances of the machine. All elements were grouped into a single massive sheet metal case; overall, the PET’s weight was about 25 pounds. 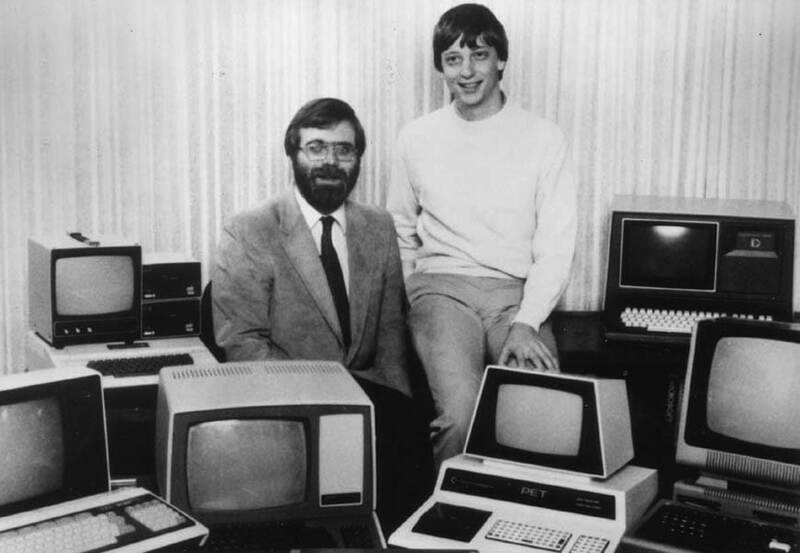 As usual for many computers of the time, the PET included, along with a minimal Operating System, a programming language pre-installed in ROM: it was a version of BASIC produced by a small company from Albuquerque, called Micro-Soft, and developed by its young co-founder, William Henry “Bill” Gates. 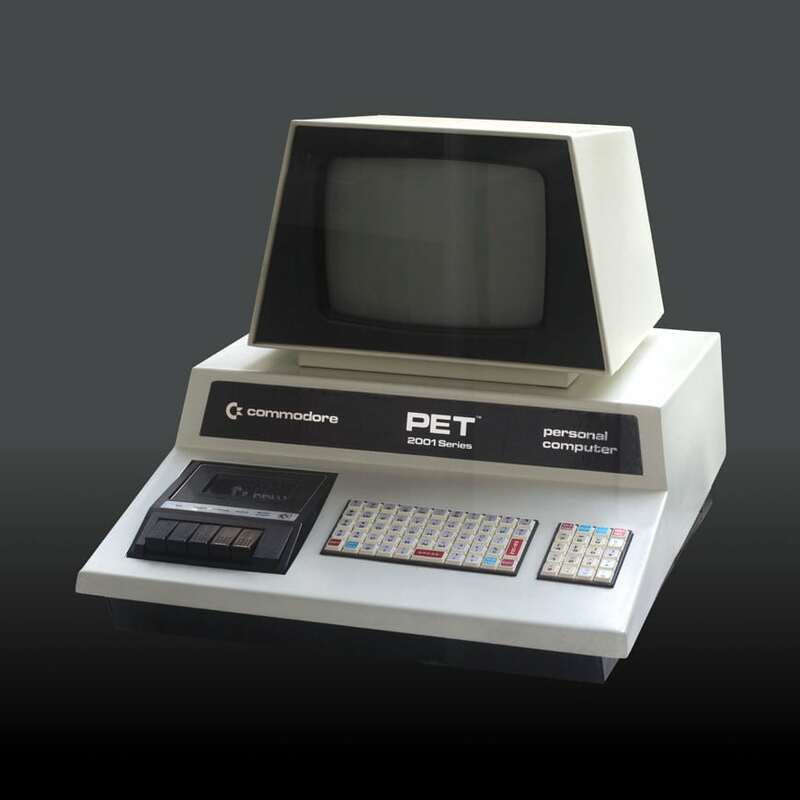 For the European market, the Commodore PET (which means Personal Electronic Transactor) was renamed to Commodore CBM (Commodore Business Machine) to avoid a dispute with Philips, which had already trademarked the name PET for a new computer, called Programm-Entwicklungs-Terminal. 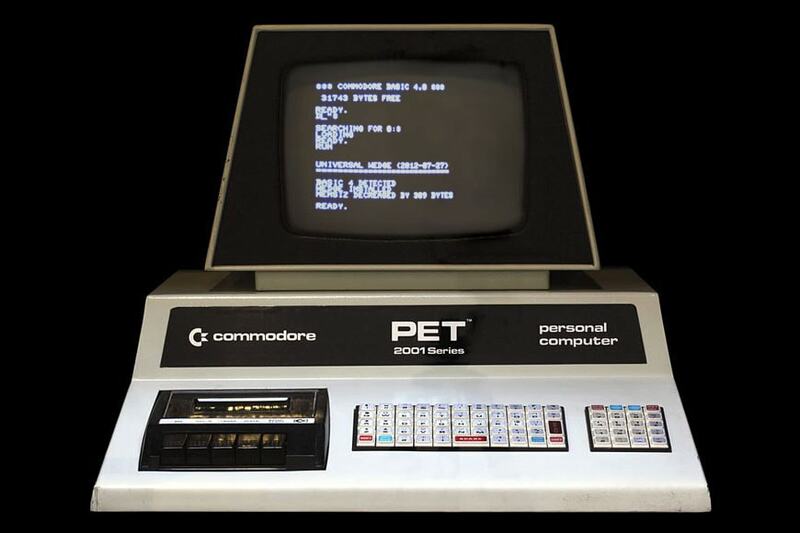 The PET’s original name wasn’t really an acronym, the Commodore wanted the name to be a three-letter one (both as a reference to Kubrick and to openly defy IBM) and “pet” seemed appropriate and friendly; therefore, a (rather) reasonable meaning for that name was creatively invented later. 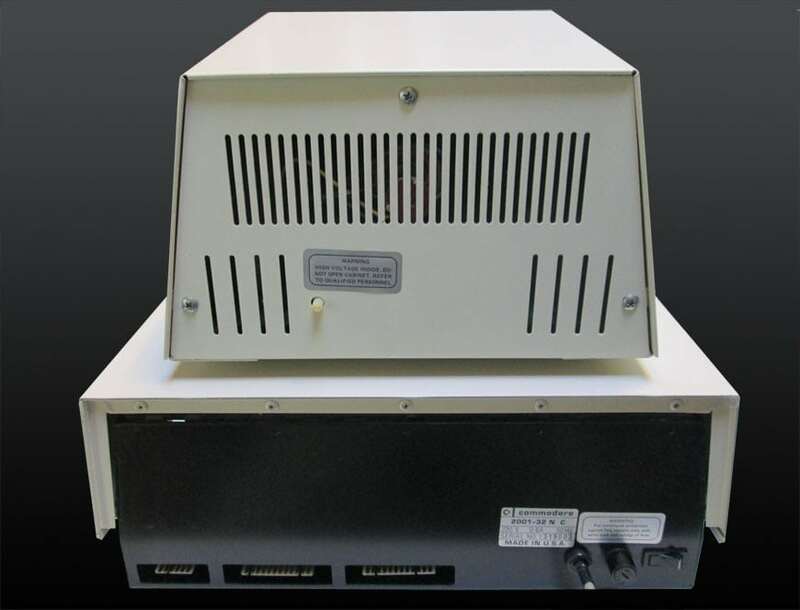 There is little doubt that the hallmark of the PET 2001 housing – designed by Chuck Peddle together with an industrial designer, Larry Hittle – is its peculiar trapezoid-shaped monitor. Despite the all-in-one concept of the PET, nevertheless, the monitor looks more a separated part “welded” to the computer’s sturdy base than a formally integrated one (yet, this was common to almost all unibody computers of the time, until the advent of the Macintosh). 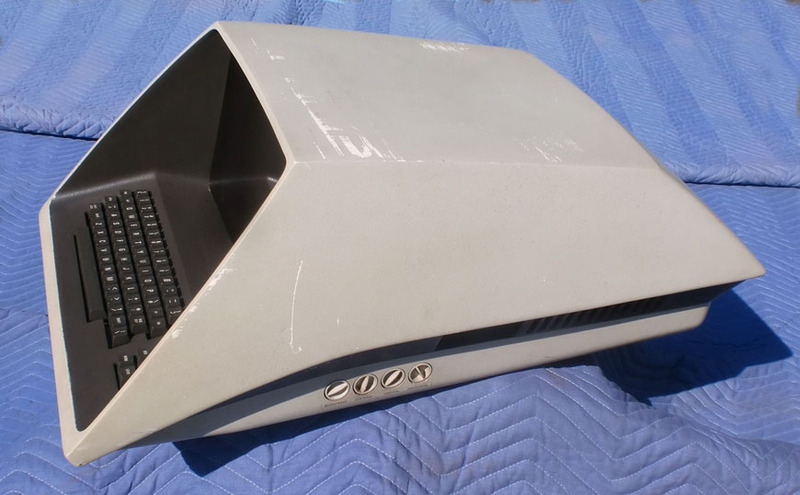 It should be mentioned, that Commodore originally intended the PET to have a less sharp case made in plastic, but then reverted to a sheet metal container, produced by a Canadian office furniture company also owned by Tramiel, in order to reduce the computer manufacturing cost. This move caused issues to Commodore later on, since the slow manufacturing process of the metal case became a bottleneck in the production of the large number of machines that clients were requiring after the unexpectedly fast success of the PET. 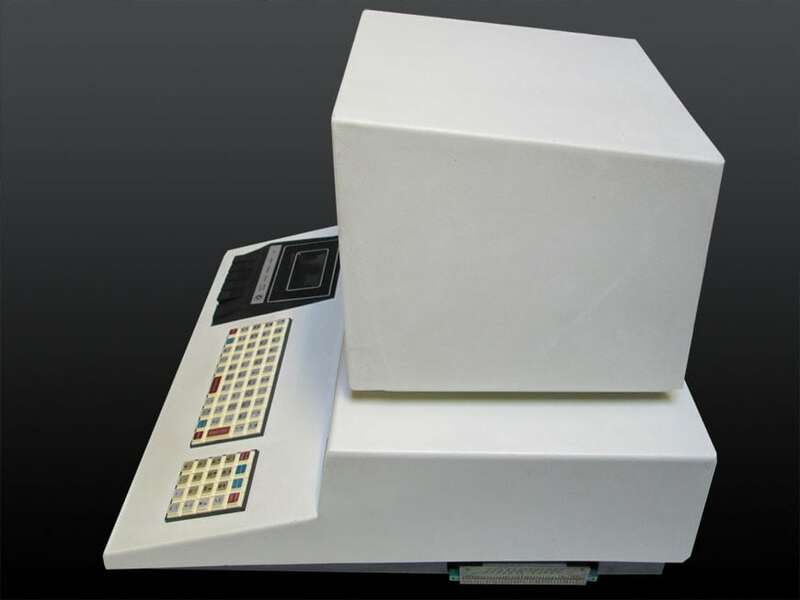 Aesthetically, the PET was a typical son of the ’70s, with the same angular forms of many other industrial products of the period, and its bright white case. 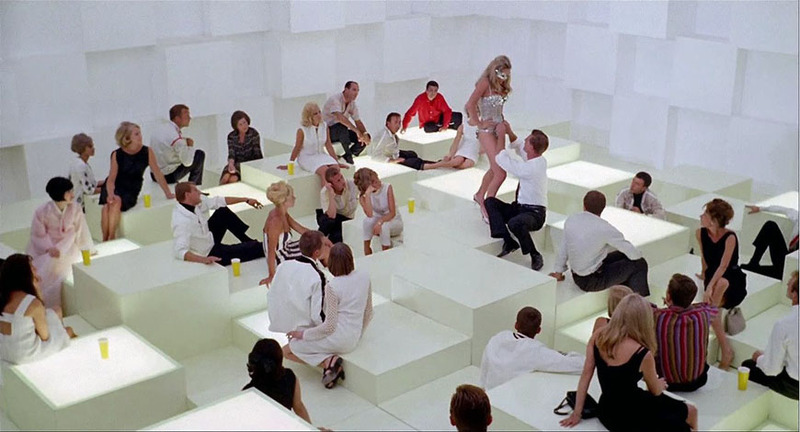 In the ’60s and ’70s, white was widely considered THE color of the future, as we can see in various American and European science fiction films, such as The Tenth Victim by Elio Petri (1964), George Lucas’ THX 1138 (1971) and, of course, 2001: A Space Odyssey. 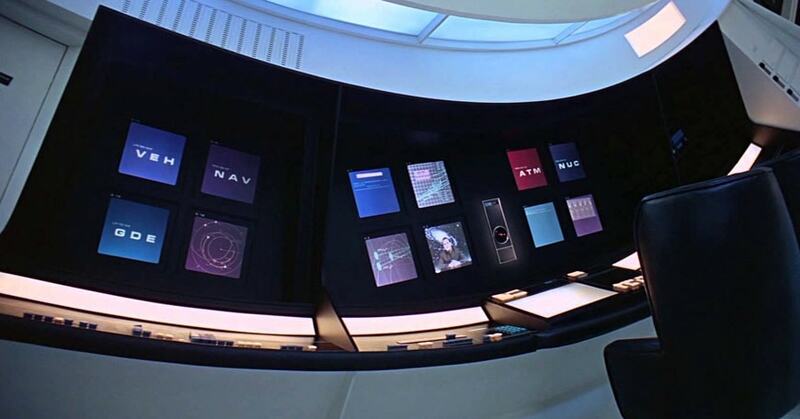 The design of the computer case itself has more than a superficial resemblance to with the futuristic videophone with which Dr. Floyd call his daughter in Kubrick’s film. The ambitious plan to fit the monitor, electronic boards, mass-memory devices, and a keyboard into a single container, small enough to be easily placed on an office desk, caused some problems. 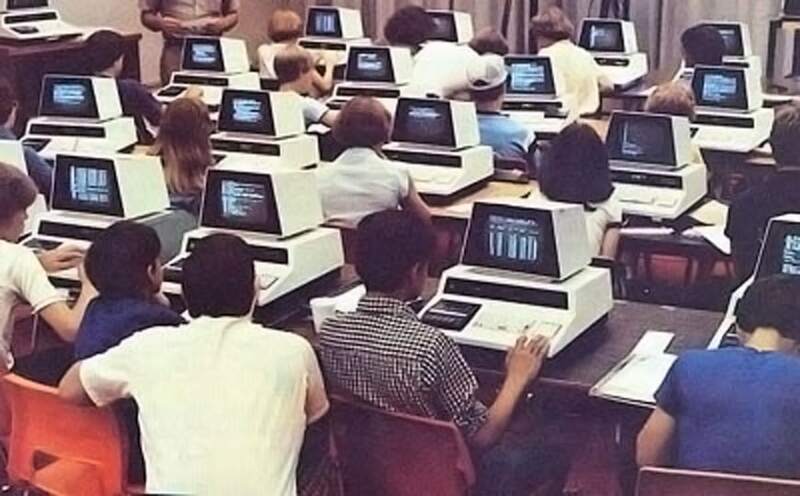 For example, there wasn’t enough room for a real computer keyboard, and Commodore (which was also producing electronic calculators) replaced it with a small calculator-style rubber keyboard. Unfortunately, such chicklet keyboard was not appropriate to write long texts since it lacked a proper tactile feedback, therefore the user had to constantly check on the display if a letter had been actually typed or not (a more effective plastic keyboard was introduced later on). An interesting feature of the PET case was that it was composed of two parts, hinged to one another, designed so that it could be quickly and intuitively opened like a car hood (it even included a prop rod). 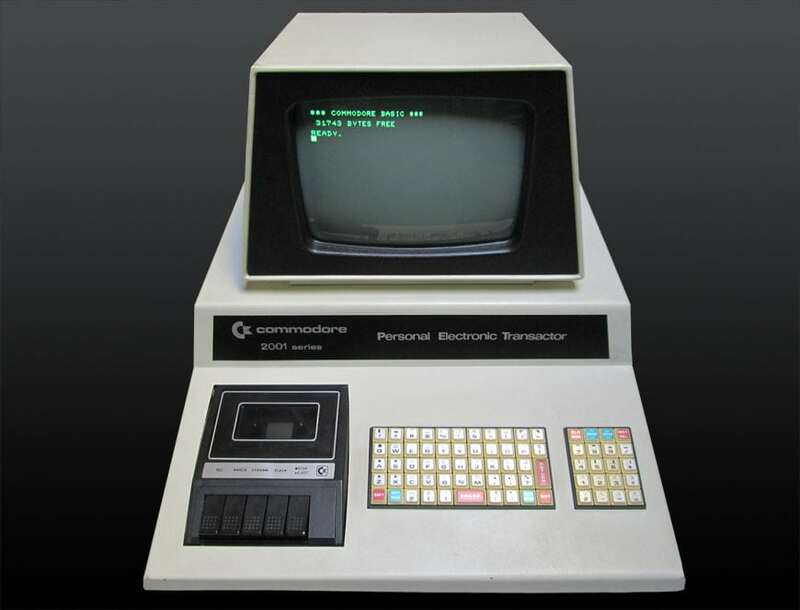 Thanks to its competitive price of less than $600 (2,400 in today’s dollars and about half the price of the coeval Apple II and Tandy TRS-80), the Commodore PET was a huge success; believe it or not, in 1980, Commodore was the third largest personal computer manufacturer in the world. Unfortunately, both for the PET and Commodore, the golden age didn’t last long; within few years, two lethal competitors were standing around the corner: the IBM PC and the Apple Macintosh. 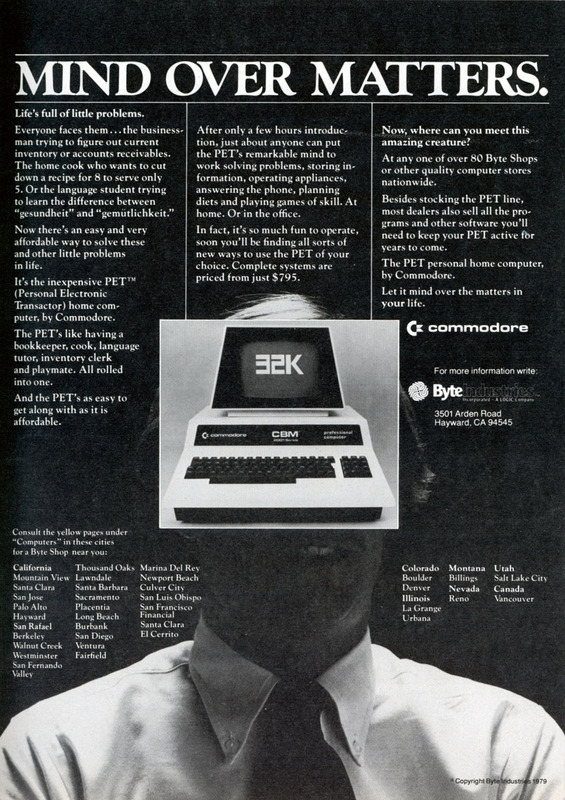 Nevertheless, after the PET, Commodore was still able to create a sequence of successful products during the ’80s – comprising inexpensive home computers such as the Vic-20 and the Commodore 64, and the graphic-oriented machines commercialized under the brand name Amiga – which prolonged its life until 1993, when the company was finally forced to declare bankruptcy. Finally, just a little game. Which 1985 film featured this robot dog, whose head somewhat recalls the case of a PET 2001?